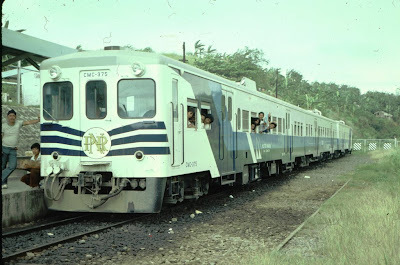 Lindsay Bridge got a photo of this three car CMC/CTC/CMC set standing at Carmona station back in the earlier days of the branch. Sadly the station had developed into a jungle by the time of my visit in 2009. It had been closed since Typhoon Reming in 2006 and to date there has been no word on when it will reopen, and no actual clarification to what damage the typhoon did. Next week we plan to do a more instensive photographic survey of Carmona in 2009.